Ivo van Hove has been directing for thirty years. Born in Flanders and director of Toneelgroep Amsterdam since 2000, his impressive portfolio covers theatre, film, television and opera, and he has worked extensively across Europe and America. His profile in Britain has never been higher. When he brought Roman Tragedies to the Barbican in 2009, it was met with both critical and popular acclaim. At the beginning of February 2011 he returned with the Antonioni Project, which, with a few exceptions, also received a barrage of four and five star reviews. We meet the day before the Antonioni Project is set to debut at the Barbican at the Thistle Hotel where he is staying. There is a quiet air of confidence about him, although certainly no trace of cockiness. For van Hove it would seem that confidence simply equates to a belief in what he is doing. This 140-minute long play is a new take on Michelangelo Antonioni’s trilogy of early 1960s films – L’avventura, La notte and L’eclisse – which all focus on couples failing to connect with each other and the world around them. The play melds the three films into one because van Hove felt that the characters in the various stories could simply be older and younger versions of each other. This leads to the three plots intertwining, and the people from the different films coming face-to-face. Amidst the other films that van Hove has adapted are two Ingmar Bergman pieces, Scenes from a Marriage (1973) and Cries and Whispers (1972). The latter focuses on the character of Agnes who on her deathbed is unable to find love or connect emotionally with anyone around her. 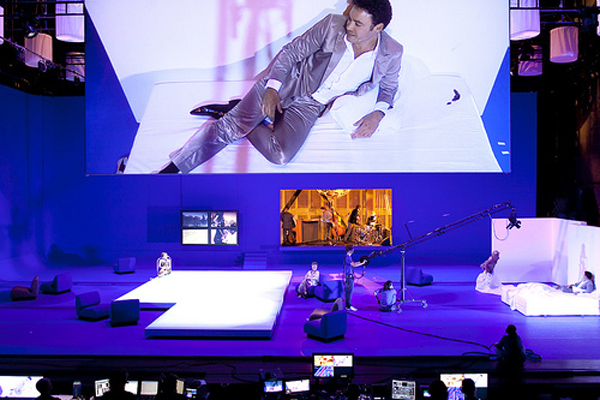 In the film the predominant colour is red to highlight blood and sexual repression, but van Hove saw Yves Klein Blue dominate the set and made the piece a less religious and more existential experience. He took a description that Bergman provided, but didn’t develop, that Agnes had vague artistic ambitions, and made her into a performance artist who dies under the lens of her own camera.